Please note this program is for children ages 4.5 to 7 years old. If your child is 7 years and 1 day they have exceed the age requirement for this program. BSA believes creating a love of the game starts from early childhood. 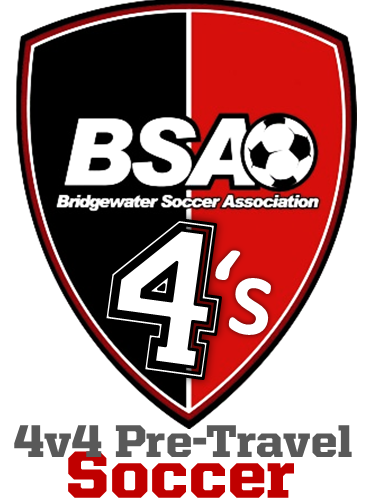 The BSA 4’s program promotes what we like to call "fun and focus soccer". We work heavily on foot-skills, decision making and small sided game play, all in a fun environment. Game related soccer is heavily utilized to keep the kids attention. Touches on the ball are key and rarely will the players be without a ball at their feet during this program. Individual skill development is stressed and 1v1 and 2v2 scenarios are common. We generally play 4v4 and incorporate the “numbers system” teaching players better positional awareness and the freedom to make better decisions from a very early age. BSA 4's will run spring, summer, fall, and winter programs. In case of a weather cancelation, we will update the web site and will email you. please report to the field. This will be the format throughout the season. At BSA we are working to ensure that every player that enters the BSA 4's program will enjoy the best soccer experience possible. To achieve this we have established a set of expectations for players, coaches and parents. The philosophy of the 4's program is that the program is a fun, progressive soccer experience for players who are seeking to improve their game, in most cases with a view to joining a travel soccer program when the opportunity arises. Sessions will be delivered in a safe environment that will allow players to develop and gain confidence through the individual attention provided by qualified and experienced soccer educators. It is this environment that will facilitate the growth of each player as a young athlete. While much of the program incorporates activities and games which contain an element of competition, players are not measured by the number of wins or losses that they experience. During 4v4 small-sided games or scrimmages no score will be recorded and there will be no extra value placed on goal scorers over any other players. We urge parents to reinforce the value of effort and application over goals scored and game results. All players will be taught to enjoy all aspects of the game incorporating both defending and attacking. The small-sided scrimmages do not include positional players and no players will be permitted to “specialize” at any particular attacking or defensive role. Where goalkeeping may be introduced all players will participate equally. All players are entitled to equal playing time unless their behavior prohibits this (see below). The 4's grassroots trainers are expected to give each player equal time and energy. If any player’s behavior or discipline inhibits this practice, a player may be asked to leave the program. This would only occur after consultation with the player and parents. Trainers are instructed to uphold a zero tolerance policy with regards bullying. We encourage open communication between players, parents and trainers. We are all here for your child and it can be very valuable to keep communication channels open and positive. If you have any questions or concerns about any aspect of the program that you feel that you are not able to share with your child’s trainer please contact the BSA 4's grassroots Director. We are looking forward to the spring and the growth of the area’s best player development soccer program over the coming seasons. We appreciate your participation and hope that you agree that our BSA 4's prgram is the Best Soccer Around!